Fortune Township is a residential development of Fortune Realty. Located in Barasat, Kolkata it is built across a wide area. These luxurious 2BHK, 3BHK and 4BHK housing units make it a dream home to everyone. These apartments are beautifully crafted with modern amenities. Barasat is a developing region which is swiftly picking up the pace in the sectors of Education, Retail, Hospitality and IT. It has a lot of greenery and open land which is attracting a lot of attention from the builders. It is well connected to all the important roads of Kolkata. It offers all the basic amenities like schools, hospitals, malls, railway station. Where is Fortune Township located? The project is located in Barasat, Kolkata North. What are sizes of apartments in Fortune Township? The apartment sizes in the project range from 570.0 sqft to 1844.0 sqft. What is the area of 1 bhk in Fortune Township? 1 BHK units in the project are available in a size of 570.0 sqft to 573.0 sqft. What is the 2 bedroom size in Fortune Township? 2 BHK units in the project are available in a size of 731.0 sqft to 1479.0 sqft. What is size of 3 bhk in Fortune Township? 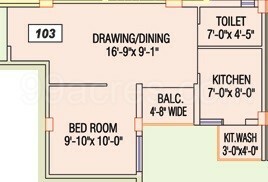 The area of 3 BHK apartments ranges from 1019.0 sqft to 1844.0 sqft. What is the 4 bedroom size in Fortune Township? Four-room units (4BHK) in the project are available in an area of 1650.0 sqft to 1743.0 sqft. Hi Bibha, you can post your advertisement here: http://www.99acres.com/do/advertiseproperty. The first two listings are free. For paid packages offered by 99acres, please refer to this link: http://www.99acres.com/do/buyourservices You may write to us at feedback@99acres.com or call us at our Toll Free # 1800 41 99099 (Monday - Saturday 9:30AM to 6:00PM IST) for further assistance. Kindly refrain from posting your contact details as this is against our community guidelines. You may edit your answer and remove your contact number to prevent your answer from getting marked as report abuse.